Inception. The King's Speech. The Social Network. Black Swan. These are undeniably the most famous, critically acclaimed and rewarded films of 2010. This was shown and proven at most award ceremonies. The Social Network swept the Golden Globes, the King's Speech dominated the BAFTA's, Inception gained the joint most awards at the Oscars, Natalie Portman collected every Best Actress award out there for Black Swan. Until the other day, I'd only seen three of them. Inception; mind-blowing and mesmerising. The King's Speech; emotional and fully satisfying. Black Swan; terrifying and horribly intense. Recently, I saw The Social Network. So, here. The Social Network: gripping and pure amazing. 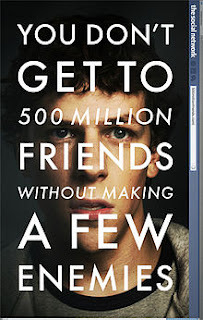 As I'm sure you're all aware, The Social Network tells the story of Mark Zuckerberg (Jesse Eisenberg); the creator of Facebook. However, instead of seeing him in billions of dollars, we see him a court room being sued in two lawsuits simultaneously. Through flashbacks we learn why, who by and, most importantly, the gripping story behind this ordeal. And what a story it is! Let me just say, with all the hype and attention The Social Network received, I may have cried if it disappointed, and deleted my Facebook account in spite. However, this was not the case. The Social Network did NOT disappoint. In fact, what I received, was probably my second favourite film of 2010, and a film that can easily enter my top 10 of all time. It really is as good as it's made out to be. The first aspect I have to praise is the acting. First off, Eisenberg. he really was outstanding. He plays Zuckerberg perfectly, mixing comedy, seriousness and drama, he really pulls it off. In fact, I kind of wish now that he won the Best Actor Oscar instead of Colin Firth. Secondly, Andrew Garfield. I'd probably say that he was the highlight of the film, as he gave one of the finest performances in a film I've ever seen. Again, Best Supporting Actor should have been here. Finally, Justin Timberlake, who I'm sure we all recognise for being a famous pop star. Nah, not any more. After his brilliant performance in this, he really ought to set his sights on acting. Arrogant and deceiving, yet...trustworthy, he really deserved a nomination too. The second part I need to mention with this is the script. It's just simply amazing. It's so simple, so easy to follow, yet you need to focus to understand it. It really pays off, and this is hugely down to David Fincher's solid, faultless directing. I keep saying this, but Fincher deserved the Oscar for this as well. Hey! I'm starting to realise, this film was robbed! To be honest, it was better than The King's Speech, and deserved more Oscar recognition. There, I said it now leave me alone. This won Best Score at the Oscars. It beat Inception AND How To Train Your Dragon, which both contain astonishing soundtracks. So, was it good enough? Yes, yes it was. The score was mainly electrical, but emotional, and upbeat, but fitting. It suits the film throughout, and leaves you feeling satisfied. I know it's not part of the soundtrack, but there is a scene set in a nightclub, where the music is really loud. It plays out as if you're actually in the location with the characters, as they have to shout, and we have to focus to hear and follow. Genious. The Opening Scene; which many claim to be one of the best movie scenes ever. Really? Yeah, hats off to Eisenberg for his speedy words, but is it really that special? I felt a tad let down by this scene, but it takes nothing away from how brilliant a movie this really was! To Summarise: Gripping, well filmed and thoroughly interesting, The Social Network represents the requirements for a great film at a top quality.